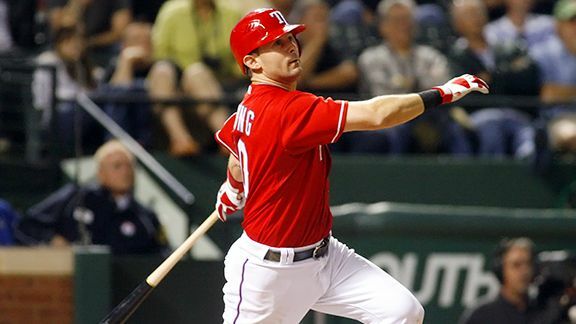 After losing two of three games at home to the punchless Florida Marlins, the Texas Rangers woke up on July 4 in a first place tie with the Los Angeles Angels of Anaheim. The defending American League champions had certainly underachieved through the first 85 games of the season, leaving Texas just four games over .500 with a record of 44-41. However, when the Rangers welcomed in the Baltimore Orioles for a three-game series later that night, their season completely changed. Since that first game against Baltimore, Texas has won 11 straight games, suddenly looking like the well-balanced squad who defeated the New York Yankees with strong pitching and timely hitting in the American League Championship Series last season. During this 11-game stretch, the Rangers have scored 70 runs, averaging 6.4 runs per game, while the their pitching staff has allowed only 24 runs, limiting opponents to 2.2 runs per game. The Rangers’ bats set the tone early in the streak. Texas scored at least six runs per game in five of the first six games, the exception being a 4-2 win on July 5 against the Orioles. 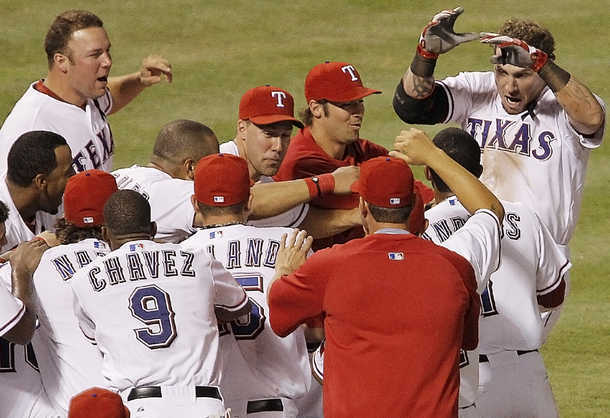 However, the Rangers did not score more than five runs in any of their next five victories. It is their pitching that has kept Texas in the win column during the second part of their streak. At one point during their streak, the Rangers threw shutouts in four of six games. In the past five games, Texas has allowed just two runs. Texas’ starting rotation has done a terrific job of not letting the Rangers fall behind early in games. The Rangers have trailed only twice, for a total of 10 innings, in the past 11 games. During the win streak, Colby Lewis is 2-0 with a 2.91 ERA and 21 strikeouts in 21.2 innings. Matt Harrison is 2-0 with a 1.27 ERA, 16 strikeouts and two walks in 21.1 innings. 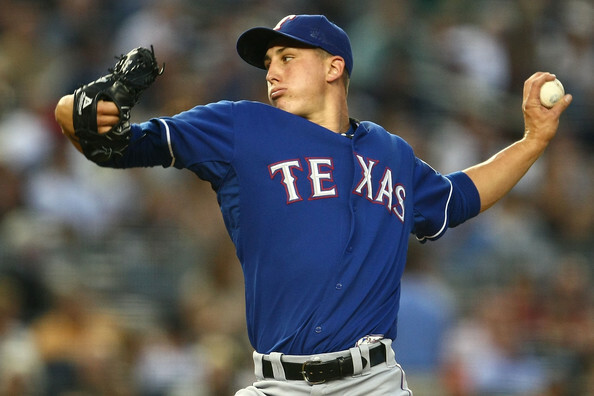 Derek Holland has thrown 18 scoreless innings, going 2-0 while allowing only 12 baserunners and striking out 15. C.J. Wilson is also 2-0 with a 3.21 ERA and 15 punch outs in 14 innings. The Rangers’ bullpen has also done a phenomenal job of shutting the door on opponents in the late innings. Texas relievers have allowed only three runs in 16 innings (1.69 ERA) with Neftali Feliz racking up four saves in the process. Offensively, Michael Young has stayed hot during Texas’ winning streak, hitting .390/.419/.610 with four doubles, one triple, one home run and eight runs batted. However, a number of Texas bats have heated up along the way to protect Young in the lineup. Mike Napoli (.423/.464/.923 with four doubles, three homers and nine RBIs during 11-game winning streak), Ian Kinsler (.326/.404/.652, six doubles, three home runs and five RBIs) Josh Hamilton (.293/.313/.512, three doubles, two homers and 12 RBIs), Elvis Andrus (.357/.404/.429, three doubles, four RBIs, two stolen bases) and Endy Chavez (.462/.444/.654, two doubles, one home run, five RBIs, two steals) have helped form the deep and dangerous lineup that Texas had lacked until those players started their own fireworks show on Independence Day, a show that has continued throughout the Rangers’ win streak. Texas’ lineup finally looks like it has in years past, with threats at the plate one-through-nine in the order who constantly make the pitcher work. Since July 4, the Texas Rangers have suddenly clicked after not playing to their potential through the first half of the season. Strong pitching and an offense that is displaying the firepower it is capable of has led the Rangers to an 11-game winning streak. Texas has spread its lead in the AL West over the Angels to four games. The Rangers now head to Los Angeles for a three-game series with the Angels that starts tonight. If baseball’s hottest team can keep it up, Texas can push the Angels even further into their rearview mirror. They may have underachieved through the first half of the season, but this winning streak has the Texas Rangers firing on all cylinders. Just like that, they look like they will be a serious threat once again in the American League come October. This entry was posted on July 19, 2011 by Scott Kornberg. It was filed under Texas Rangers and was tagged with C.J. Wilson, CJ Wilson, Colby Lewis, Derek Holland, Elvis Andrus, Endy Chavez, Ian Kinsler, Josh Hamilton, Matt Harrison, Michael Young, Mike Napoli, Neftali Feliz, Scott Kornberg, texas rangers.